The most beautiful thing is when the joy I get from drawing jumps out onto the viewer, making them smile too. A picture is worth a thousand words, so why not tell a story? 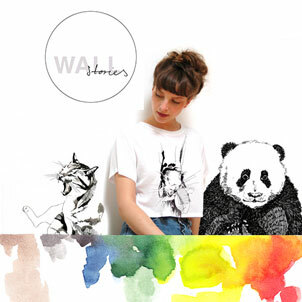 WALLstories brings animals to life on canvas, transforming them into the protagonists of each work. From penguins, to deer, to zebras, Cologne-resident Lea Sofie has developed a picture series in which exotic and domestic animals alike take centre stage. Often finding inspiration in the natural beauty and tranquillity of her parents’ home in the Eifel mountains, she creates lively and detailed animal portraits which stimulate our imaginations.